Tonight Vanity Fair announced that Christopher Hitchens, the polarizing author and essayist, died on Thursday night at M.D. Anderson Cancer Center in Houston due to complications of esophageal cancer. He was 62. There will never be another like Christopher. A man of ferocious intellect, who was as vibrant on the page as he was at the bar ... Those who read him felt they knew him, and those who knew him were profoundly fortunate souls. 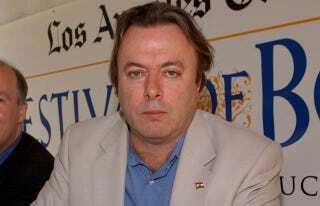 Hitchens is being remembered for his controversial stances on topics including atheism, the Lewinsky scandal, the Iraq War, and Mother Teresa. His Associated Press obit also references his infamous "Why Women Aren't Funny" essay, which seems fitting since Hitchens was the kind of guy who'd want to be remembered for both the good and the bad.